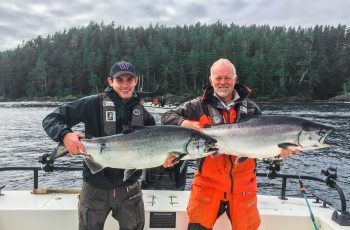 Hello again from the Clubhouse at Langara Island, our season is up and running and this is the first accurate report of the season. 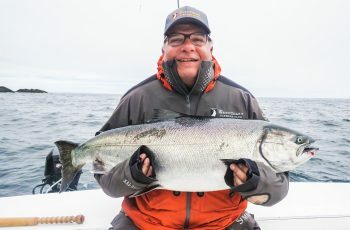 Yes, I am back out on the water in search of the ever elusive Chinook salmon, the fish of choice on the west coast and here at the Club. I will be endeavoring to write daily reports and updates as things begin to unfold here in Dixon Entrance West, West Coast Charlottes! This blog will as per usual concentrate on the fishing, and the local techniques and strategies, with some added color and a touch of gossip and hearsay from the guides down at the dock, and around the island. We have our regular strong crew of guides back for the most part, and I am excited to announce Pat Simmons has returned home for the summer, wearing even more wool than I can remember. Pat proudly wore his wool pants and rubber boots right out of the south terminal on a hot sunny Saturday, arriving via boat from Masset with his crew of vets, including Bud Stafford and Kory Fletcher. Pat hardly recognized his 27 foot Whaler, finally giving in and joining us with a new tee top and some much needed protection from the elements. We have been out fishing since Monday the 28th of May. We have found the fishing so far to be spotty and quite slow, with the odd nice fish appearing and trickling by. 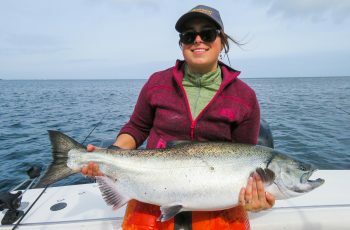 Our top fish so far is a Chinook of some 29 lbs taken this am off Andrews Point, at a depth of 80 feet off the downrigger. A couple more were hit in that area, similar depths. The fish are tending to be in the teens, with a couple surprises here and there in the mid twenties. I have been on a rather large search for the spring Chinook, searching a grid fro Shag Rock to Lacy and all points in between. I did have a decent fish on at Eagle Rocks yesterday, but was trolling several hours between bites, so I guess I blew it. Kui had a look at the Jalun and came up dry, the boys did grab two at Mac, in the mid twenties. I had a look at the lighthouse Tuesday with Bud in 35 knots of S.E. hiding in the bay in tight, observed bait and eagles, but lacking in the salmon department. Tonight I pounded out to Lacy in 25 knots straight south shot, towering swells and a good chop, Swanton bank had 25 foot combers crashing over over it, what a sight! Zero fish on the change, but I felt tough, and my guests enjoyed the scenery. 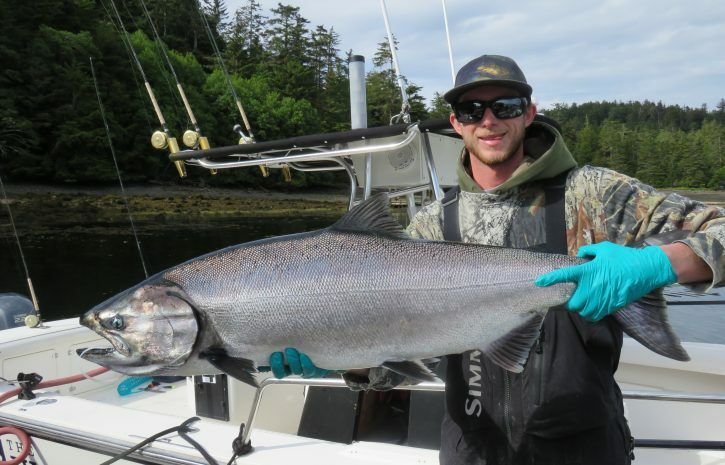 The boys grabbed a total of five Chinook off Andrews in the early afternoon. Heard a guide grabbed a pink up at the rocks, well done! No orcas to report yet, a few humpbacks are surfacing now, and oh yes, the sea lions are on patrol at Cohoe Point and Boulder. The rocks are absolutely pasted with rock dogs, one big male has a huge ghastly gash across its back, with lbs of exposed meat hanging, yes this old boy must have been hit by a large vessel of some sort. So, we are on trip two, and I hope to have a more encouraging report to relay, the local gossip is that a good run is off the west side, about 100 miles south, so we are anticipating a turnaround here shortly. Off to bed I go, tomorrow is the day the run just might show up with heavy fishing and happy guests. 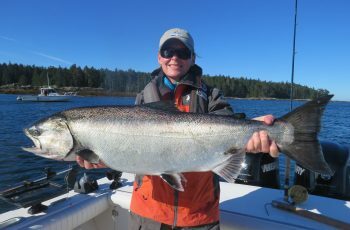 I am eagerly anticipating my fishing trip in Mid June. I am dedicating this trip to my Grandfather who taught me how to fish. 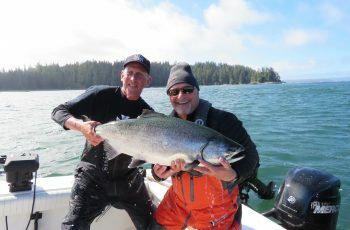 Upon my first king salmon caught we will sprinkle a token amount of his ashes and hoist a shot of whiskey. Thanks for all the posts. I will be there Aug. 29 to Sept 02, and will fly fish for silvers, like spey casting. first trip north since retiring from guiding at Pybus Point Lodge on the south end of Admiralty Island. in SE Alaska. Sincerely , Les Olsen….. Tight lines….